Marius Andries is one of our most familiar names from the main label, proven to be one of the most versatile artists Sweden has to offer he once again claims the spotlight! Featured as the 12th release from our label, Carnage delivers a hard dark floorfiller. Drawing inspiration from nineties soundscapes and melodies, Carnage mixes acid and percussion driven rhythms and colorful ambience with progressive influences. 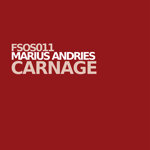 Carnage comes both as original and extended version to suit all occasions plus 2 additional mixes from upcoming producer C.O.J.H and Sweden’s psy-veteran Rokkaz. While keeping the main parts and characteristics from the original both remixes flirt widely across genres sealing this package. Carnage has hit the shelves and is now available exclusively at Beatport! Make sure to grab your copy here!